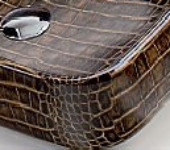 My new discovery, a breathtaking and really cutting edge design crocodile print counter top wash basin collection presented by Arch Expo, can please the most demanding and style conscious buyer. ArchiExpo is the permanent virtual exhibition, connecting manufacturers and buyers in 5 languages, around the world. With 1.5 million visitors a month sourcing from over 20,000 high-standard architectural products, it is the biggest online specialized show. “This is an unconventional and refined idea with a strong contemporary personality and a look that is strikingly attractive, representing an innovative interpretation of decoration coupled with the exclusivity of a unique one-off product: JUNGLE, in fact, is the perfect example of a new customized design approach for the bathroom, which sets out to amaze with an exuberant elegance and a slant that is highly spectacular. An haute-couture collection that is fruit of a meticulous activity of experimentation and exclusive technology and which derives from a research into the expressive potentiality of ceramic material and its visual and tactile perception. 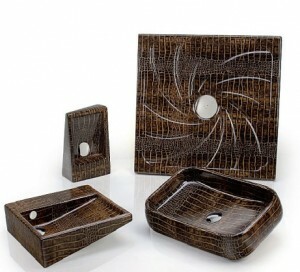 For JUNGLE, Ceramica Cielo has chosen unusual materials for this category of products, such as precious python and crocodile skins which, thanks to an exclusive manufacturing technique, mould and meld into the ceramic to produce an end result in which visual perception succeeds in perfectly conveying the material and tactile effect typical of these skins.